This greeted me this morning. Lovely. 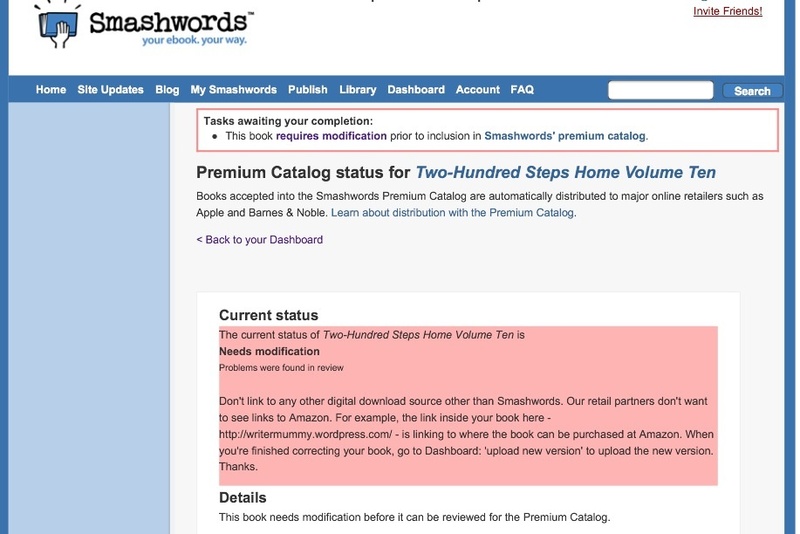 I woke this morning to a message from Smashwords, saying that one of my Two-Hundred Steps Home volumes has been booted out of the Premium Catalogue because of a link to a competitor site, which is frowned upon. I had already been alerted to the issue through a ticket opened by Apple, saying I had a link to Amazon in my book. I’d only reloaded the offending volume (which had previously been approved for Premium Distribution) because Barnes and Noble weren’t pulling through the front cover. As I may have mentioned in the past, formatting for Smashwords could drive you crazy! I couldn’t find any Amazon links, so I went through and removed all the links except my blog, Facebook and Twitter ones. Considering that the whole purpose of writing THSH this year, to the detriment of my other projects (not to mention sleep and sanity) was to promote the blog and hopefully sell books, I figured that was fair. I offer the books for free, after all. Then I got this message from Smashwords telling me the link that had Apple in a tizz was the writermummy blog link because my blog has links to my novels on Amazon. I mean, seriously? That would be like telling me to remove my twitter and facebook links because I occasionally promote my books through these channels. Paranoid, much? 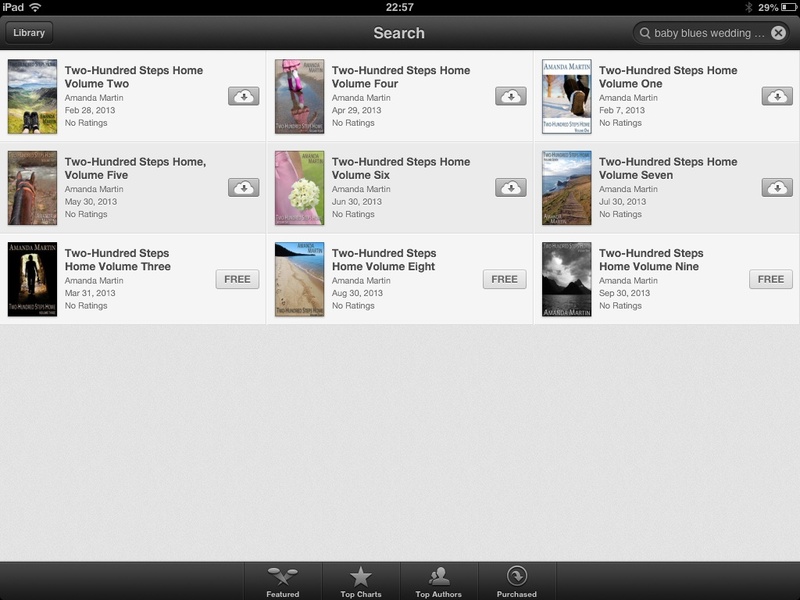 I wouldn’t mind if I’d actually sold a single book through Apple when my novels were available there. I don’t even get many free downloads from them. Unfortunately Smashwords doesn’t offer the ability to have different versions for Premium Distribution and their own store. I can take my books out of iBook distribution, but I have at least one reader I know who downloads from there and it doesn’t seem fair for her not to have access to the final volume. But taking off my blog link is absurd. The books are intrinsically linked to the blog. I read around the subject this morning, after writing a ranty message to Smashwords (a shame in itself because I’ve been a huge advocate up to now) and it seems there is no other way to get free books into Barnes & Noble (my biggest source of downloads) other than through Smashwords. I hate being cornered like that. To be fair, I don’t think many of those 2,800 B&N downloads have resulted in blog traffic (I wish!) but it isn’t the point. I don’t understand the paranoia (particularly about a free book). Either you have a Kindle or a Nook or an iPad. You will buy your ebooks through the route your device dictates. No one is going to rush out and buy a kindle merely because my novels aren’t available through iBook. Anyway, I don’t have the time to change anything now. If that means all my books end up not available through B&N or iBooks, then so be it. If anyone wants a copy and it isn’t available, then you can download the volumes in all formats directly from Smashwords (or I’ll email you a copy!). I have a long memory, though. I’ve already unpublished from Kobo because of their stunt earlier in the year. One day these retailers will realise that, without authors, they have nothing. I won’t be missed but maybe, just maybe, an author with sufficient clout will become annoyed with them. Or perhaps I’m naïve and big business does call all the shots. What a shame. Claire’s head whirled as she downed the drink on the table in front of her. She remembered now why she hated pub crawls. It wasn’t just getting drunk too quickly, and trying to move in a straight line when the world was spinning, it was the bloated tummy and the sloshing sensation as yet another quantity of liquid was consumed too fast. She reeled and felt a steadying arm wrap round her shoulders. “Whoa, there. You don’t have to keep up, you know. The real race is over. This is just the lads from the office now: no need for bravado.” The voice whispering in her ear seemed hardwired to other, more intimate, parts of her body. She focussed on staying upright and turned to him with a bright smile. Conor gave her back a quick rub, then dropped his arm. He didn’t move away, however, and Claire found his presence at her side comforting. She looked around blearily, trying to see who was still with them. She recognised most of the faces, although they all looked a little worse for wear. Only the gentle affection in his voice stopped Claire from running out the room. In fact he’d been the perfect date: attentive, supportive and encouraging. There had been a hint of distance to begin with, but as the alcohol flowed and the eyes blurred that had dissipated. She felt the warmth of his body next to hers, through the thin fabric of her dress, and suddenly shivered. Conor grasped her elbow and led her from the room. She heard him tell their colleagues that she was going to be sick and their friendly laughter followed them out. It was on her lips to tell him she didn’t feel ill, when it occurred to her that he might be protecting her reputation, as the two of them left the pub together. Ever the gentleman. Nothing like the man I took him for at my interview. Claire shivered again as the cool night air brushed her skin. It wasn’t cold, although the oppressive heat of the day had eased with the setting of the sun. Despite the bustling noise of the pub spilling through the open doors and windows, it felt eerily quiet out in the night. They were somewhere away from the High Street, having left the hubbub of the carnival behind. The race proper had finished much earlier and Conor had led his colleagues on a longer tour with the drinks on him, as a thank you for all their hard work. Above them, inky blackness stretched away, punctuated by thousands of pin-pricks of dazzling light. The sheer expanse of the sky made Claire dizzy, and she leant against the whitewashed stone wall for support. They stood together in silence, listening to the sounds of revelry from inside the building. People came and went through the door to Claire’s left, but they seemed to have a pocket of unbreakable stillness around them. Claire felt tension build like an approaching storm. Suddenly all her senses were on overdrive: her ears picking up every sound, her nose taking in the scent of Conor’s aftershave and the stink of stale beer and cigarettes. Despite the gloom, she could see Conor as if he stood beneath a spotlight. He was watching her, his eyes and teeth shining in the darkness, competing with his brilliant white suit. The silence took on texture. Conor pushed away from the railing, and the movement tightened the knot in Claire’s stomach and caused her heart to race uncontrollably, like the wheelbarrows had along the High Street earlier. Conor came to stand directly in front of her, looking down with a question in his eyes. Claire raised her gaze to meet his. She flinched as his eyes narrowed slightly. He reached forwards and gently pulled off the wig, letting her hair tumble down around her face. His eyes sought hers again, still asking the unanswered question. She didn’t need to search hard for a reply. It was a question she’d been waiting for. With a quivering smile, Claire gave a nod. At her response, the tension seeped out of Conor’s face, and he leant forwards slowly to brush his lips against hers. Claire let herself sink into the kiss. Conor’s hands tangled into her hair, cupping her face and pulling her close. She wrapped her arms around him, running her hands over the contours of his back, feeling the lithe body beneath his costume. A gentle breeze blew up the street and across their skin, bringing with it the scent of night and the salty tang of the sea. Claire inhaled deeply and lost herself in the moment. Posted on December 8, 2013 by Amanda Martin	• This entry was posted in 2013 365 Challenge, Formatting, My Novels, Self-Publishing, Writing Projects, YHA Novel Two-Hundred Steps Home and tagged 2013 365 Challenge, Amazon, Amazon Kindle, Apple, Barnes & Noble, iBook, postaday, Self-publishing, Smashword, Smashwords, YHA Novel Two-Hundred Steps Home. Bookmark the permalink. On the Smashwords front, I wouldn’t worry too much. Disappointingly, if you’re trying to distribute to other places, a lot of people with iPads use the kindle app. I suppose it just depends where you establish your library first. I was really hoping that some of the iPad users I know would download my book from iTunes so I would get some sales figures and, that then, possibly, it would get seen on there or at least promoted by apple. But no. They downloaded it with the kindle ap, every man jack of ’em. If the worst comes to the worst, just opt out of ibooks distribution, explain to your reader or try draft2digital, I think they distsribute to ibooks. Interesting. I’ve just started re-publishing some of mine on to Smashwords and I do have links (ssh!) so we’ll see what happens. I think the reader your are referring to is me (and that made me squeal with excitement that you mentioned me). If that is the case – I will just download from Smashwords (and have when I’m impatient and waiting for iBooks to catch up) but then I’m here daily or at least every couple of days anyway reading here cause I can’t wait! Hehe Jane, yes I was talking about you! 🙂 Good to hear that you’d still get the books, even without iBooks.